In Barry White voice: Awww yeah you know what day it is, it’s Book Lovers Day. Today I happened upon two new books not even planning to observe Book Lovers Day and found myself 2 new lovers! I guess love finds a way of finding you when you’re not even looking. I had an appointment with someone in career services who specializes in working with PhD students and Post Docs. He was really helpful, and it’s too bad that Penn State’s Career Services really only caters to undergrads. Be more like MSU, PSU! Before my appointment, I spotted the book: What they Didn’t Teach you in Graduate School: 199 Helpful Hints for Success in your Academic Career by Paul Gray and David E. Drew (c’mon guys you couldn’t think of one more to make it an even 200?) and they let me borrow it. It’s less than $9 on Amazon, people! I’ll let you know how it is. 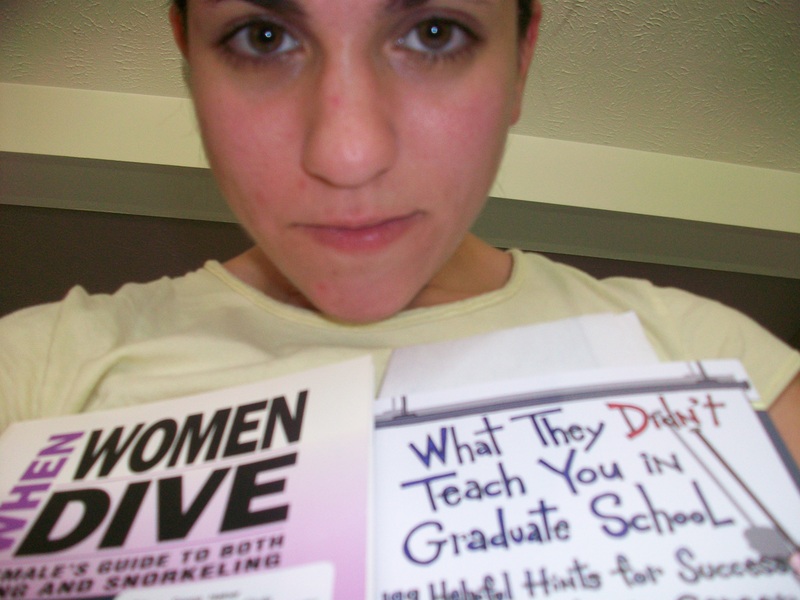 The second book I got was from my new band buddy and SCUBA enthusiast, Donna, entitled, When Women Dive: A Female’s Guide to Both Diving and Snorkeling by Erin O’Neill and Ella Jean Morgan. Only 99 cents on Amazon so I may just buy a copy for my own reference, or get a book that’s slightly more recent. I’m much more likely to read self-help type books and comedies, so I will actually, dare I say, be more committed to a relationship with these books and read them to completion. Roommate keeps LOL-ing and gasping and OMG-ing at the Help, so I suppose I should check that one, too, before I just cop out and see the movie. So wrestle around with nice, strong, hardback or cuddle up with a sensitive paperback, and tell ’em how much you love ’em. Whether it’s Pride and Prejudice or Twilight, celebrate Book Lovers Day early and often. Oh! Isn’t that post-grad school book great? I actually got stuck half-way through (my postdoc started -hehe). Are you liking it? Did you end up finishing this and the snorkeling one?